I love to live a well organized life. If you do so, this DIY project will be quite exciting for you too! I have recently created a makeup up brush roll and that offered me with a dedicated slot for each makeup brush I own and use. I am pretty excited about this new way of organizing my stuff and I cannot wait to carry it with me on my next trip. It is obvious that you can easily purchase a makeup brush roll at any beauty store, but what about the cost? What If I told you that you can get a personalized makeup brush roll at just $5? It will be your custom-made product that you can also use for your crochet needles, paintbrushes, colored pencils, and also for picnic utensils. I found sushi roll pretty useful to prepare this brush roll. You can also consider using other larger items to replace sushi roll, like a bamboo placement to gain more space. So, let’s start it now. Sushi mat, which you can easily buy from an Asian food market. It will cost only $1.99 or you can choose bamboo placement. Take the sushi mat or bamboo placement and lay it on a flat surface with the bamboo sticks pointing towards upside. Now knit the elastic band via the 2nd bamboo stick on the left. Use a hot glue gun to secure it and keep it in place. 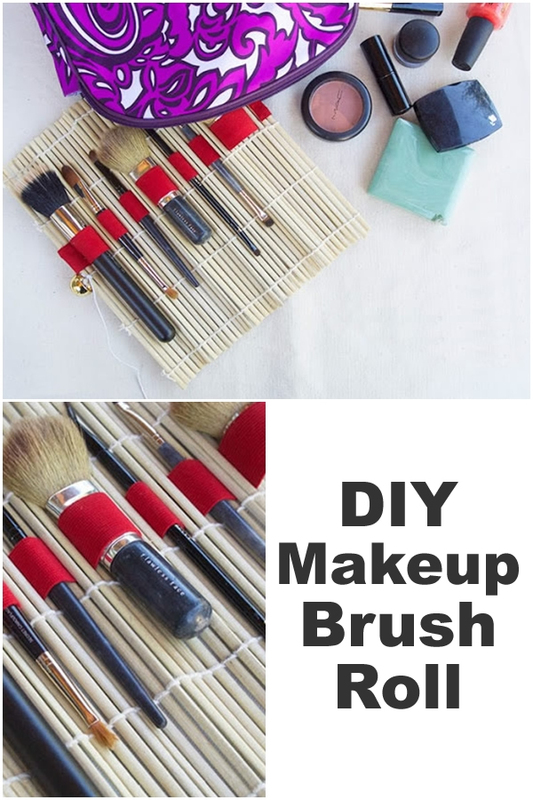 Keep knitting elastic in between the bamboo sticks to form compartments for the makeup brushes you own. Try to alternate between big and small holes if you own different size brushes like most of the individuals do. Do not forget to make holes tight enough to hold your brushes comfortably. The holes should hold your brushes perfectly and you should be able to take them out easily whenever you are getting ready. Now use the scissor to cut off extra elastic. 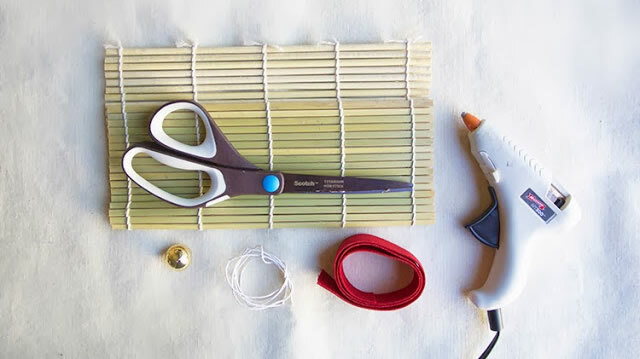 Use the glue gun to secure the end of elastic. Take a piece of yarn and run it through a button and attach it to the left end of the mat. Use a double knotting technique to tight it and leave the remaining yarn hanging. 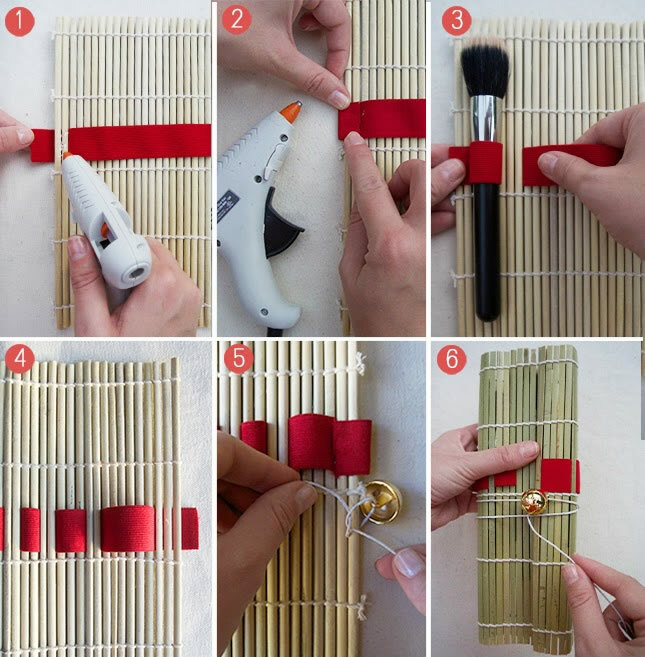 Now roll up that sushi mat, enfold the yarn across the mat, and then wrap it over the button close secure the DIY makeup brush roll. That’s how it is crafted.